It is a case that a decent detective would crack in a week. Sombath Somphone’s abduction was caught on camera and took place on a busy road at a police checkpoint. 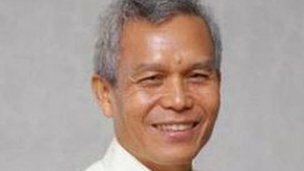 But more than four months after Laos’ leading development worker disappeared, the authorities say they have no leads and yet need no outside help finding him. It is little wonder that aid workers and diplomats in this small South East Asian nation are fearing the worst. Mr Sombath’s wife Shui-meng Ng last saw her husband in the rear-view mirror of her car. It was Saturday, 15 December 2012, and the couple were driving home in their respective vehicles along Thadeua Road, which runs parallel to the Mekong River. Mr Sombath, 61, had been doing some early evening exercise while his Singapore-born wife had attended a meeting in town. With the day coming to a close, they met up at the small shop Ms Shui-meng runs and decided to head home in convoy. Despite the absence of traffic, the cars lost contact with each other. When she got home, Ms Shui-meng waited for several hours before heading back out to look for her husband. Having found no trace of him or his Jeep, she reported him missing the next morning. On the Monday, having seen little sign of interest from the police, Mr Sombath’s family turned detective. They went to Vientiane’s main police station where they requested to be shown CCTV footage of the stretch of road where he had last been seen. “I was shocked when we saw that he was stopped by the police at a police post.” Ms Shui-Meng said. The footage showed Mr Sombath’s Jeep being pulled over shortly after 18:00 and the policeman asking him to get out of the vehicle. 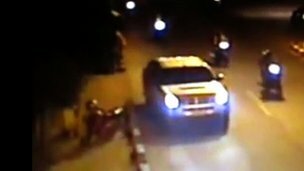 Shortly afterwards, a man arrives on a motorbike and drives Mr Sombath’s vehicle away. Less than seven minutes after he was first stopped, a pickup arrives. Mr Sombath is bundled in without fuss and driven away. It is the last time he was seen alive. With canny foresight, Mr Sombath’s family made their own copy of the CCTV by filming the monitor screen with a mobile phone or digital camera. The pictures they captured are blurry, but the contents and chronology are clear. They thought it was a breakthrough. Having installed state-of-the-art cameras all along Thadeua Road, the Lao authorities must have captured the number plates of the pickup and the motorbike. The traffic policeman at the post, if not directly involved, would also surely be able to provide some information. Unfortunately for Mr Sombath and his family, the police response has been either embarrassingly inept or wilfully blind. Despite possessing the original CCTV footage, they declared in a statement that it has given them no information on the number plates of either the motorbike or the pickup. That footage has not been released to the public and the Lao authorities have rejected all offers of foreign technical assistance to try and enhance it. A spokesman from the Ministry of Public Security said it was “unnecessary” and that this was Laos’ “internal responsibility”. He went on to say that the policeman who stopped Mr Sombath was simply carrying out random checks and could not remember anything unusual taking place that Saturday evening. For foreign diplomats in Vientiane, it just does not add up. Months of supposedly intense investigation had apparently revealed nothing more than Mr Sombath’s family had discovered in two days of amateur sleuthing. “There seems to be more that could be done,” Karen Stewart, the US ambassador in Vientiane said, barely disguising her frustration. Another diplomat with the benefit of anonymity was more blunt. Laos is in name, at least, still a communist country. On the streets of Vientiane, backpackers happily take pictures of the many red flags bearing the hammer and sickle fluttering alongside the Lao national flag. But as the country fell a long way behind its rapidly growing neighbours, its leaders changed tack and made some steps to open the economy up. Though now riddled with corruption, Laos is now more market than Marx. But political change has been much slower. Laos remains a one-party state and has been dominated by the Lao People’s Revolutionary Party (LPRP) since independence in 1975. In the absence of an opposition, aid agencies and civil society groups are treated with huge suspicion, and on occasion, outright hostility. For 30 years, Mr Sombath had successfully navigated Laos’ complex internal politics. Returning from university in the US in the 1970s, he initially worked in agricultural development. Then in 1996, he founded his own organisation PADETC, which encouraged and empowered young people. He won awards and then retired in the middle of 2012, hoping to live life at a slower pace. Soft-spoken and non-confrontational, Mr Sombath was never an activist or agitator. But many link his disappearance directly to the role he played organising a meeting of the Asia-Europe People’s Forum (AEPF) in Vientiane in October 2012. The People’s Forum was a chance for Lao grassroots organisations to meet and speak with activists and campaigners from around the world. It was unprecedented by Lao standards. Mr Sombath was a key part of the organising committee and helped run a regional discussion process that then contributed at the international meeting in Vientiane. “Never had citizens here been consulted in that way before,” a member of the Lao aid community said. Some excitedly hailed the meeting as a sign that the political space was beginning to open up. But for some members of the ruling elite in Laos, it was clearly a step too far. In December, the head of the Swiss NGO Helvetas, Anne Sophie Gindoz, was expelled for “breaking the rules”. Ms Gindoz had just written an email to partners critical of the Lao government and the lack of freedom of speech. She had also been heavily involved in the People’s Forum. 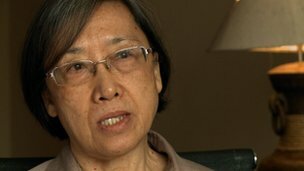 Ms Gindoz was told to leave Laos on 7 December. Just over a week later, Mr Sombath was stopped at the police checkpoint. One Western diplomat in Vientiane said they believe Mr Sombath was now caught in a power struggle between conservatives and reformers within the Lao government. “The Defence Ministry remains the most important ministry in government,” he said. 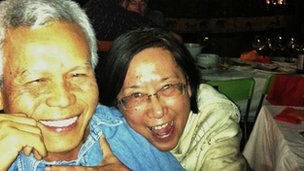 Mr Sombath’s wife Shui-Meng Ng is now trying desperately to ensure her husband is not forgotten. When we spoke in Bangkok, she told me she has been given no indication as to whether he is dead or alive. “I keep waiting. I keep hoping for some news about his whereabouts. It’s been very stressful and very draining for everyone,” she said.